Zone 3. Very hardy native species. Native plantings. naturalizing. mixed beds. Easy. Shear after flowering to keep tidy. Divide every 3 to 4 years or when clumps become too large. Spiderwort is a sprawling plant that some consider unsuitable for mixed borders. In my opinion, its long bloom period and lovely flowers in shades of blue and lavender more than make up for any shortcomings. Plants are 18 to 30 inches tall and begin blooming in late spring. Cutting back hard in midsummer will keep the plants tidy and result in new growth and a second bloom with the advent of cooler, late summer weather. They make a nice addition to wildflower gardens. Division is not generally necessary but it may be desirable to thin plants out every third year or so. This can be done either in the spring or fall and is a good means of increasing or sharing plants. New plants should be spaced about 18 inches apart. 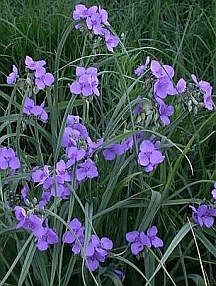 Spiderworts are like daylilies in that each bloom lasts only a day or so. These are readily replaced by new flowers. They can be cut for bouquets although the blooms often close in the evening. The stems exude a sticky sap that some may find annoying.